The 21st century is a completely different era characterized by high technology in everything. Things have been made so easier nowadays as you can access any service at the touch of a button while in your office or even travelling. The same case applies in the world of embroidery. Designers now have a wide range of machines to select from. New and advanced inventions are popping up each side you turn to. That makes it difficult for newbie and even expert tailors to make up their minds on what to take. 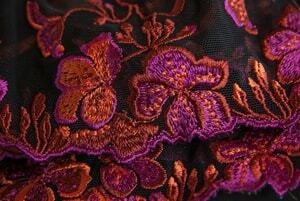 Embroidery, the craft of decorating fabric with a needle and thread, has been around for centuries. As with everything today, technology is available to make the practice easier. If you’re a designer, it is in your best interest to investigate embroidery machines. These devices can assist your with all of your tailoring work. Of course, like with all product purchase, you need to make sure you’re choosing the right unit. Tools available for you right away. Embroidery machine takes up little space. Free to be creative, expressing artistic talents. Customers can be found in many places. What Are the Benefits of Best Embroidery Machine? 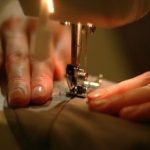 Starting your at-home embroidery business can seem risky and overwhelming, but we’re here to help lighten your burden. With the ability to work from home, you can set the pace while earning extra income. First, you want to choose your audience and products. Next, you need to choose your machine. 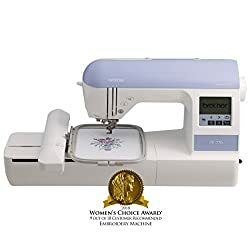 What to Look for Before Buying an Embroidery Machine for Home Business? Before buying the machine, you always want to focus on your needs and your products. You want to make sure it can handle the designs and materials you want to use. In addition, you want to look at machines that give the best value for your money while performing well. The Brother SE-400 may be the most versatile machine on the market. 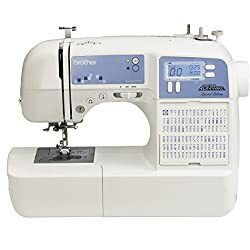 Straight-stitch, quilting, embroidery – almost any task that the inspired seamstress wishes to do can be done by this handy, value-for-money machine. The built-in library holds a multitude of designs, lettering fonts and designs for frames. Designs are easy to find on the LCD touch-screen. 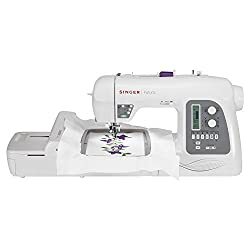 The combination of speed control, computer connectivity, and iBroidery compatibility make this machine a great all-rounder. Home seamstresses will find that making clothes for their children is very easy and that adding those creative touches is easy too. 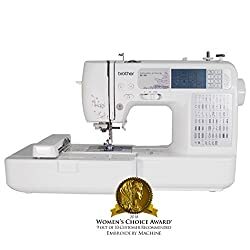 Beginner craftswomen will find this machine is easy to learn on and they will be charmed by the results of their labor. Buy this machine for its ease of use and its all-round ability. When you are ready to update, you can add the very latest designs and functions by connecting this machine to your computer. Finally the first 2-in-1 machine on our list. 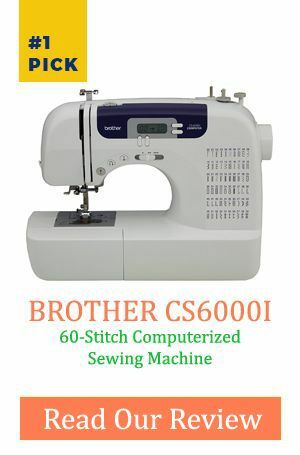 Brother Sewing SE600 does exactly what its name says; sewing and embroidery. In this review, we will restrict ourselves in the margins of its impressive embroidery capabilities. Brother SE600 returns to the company’s old boxy design albeit with a much attractive look than any other member in of the extended SE family. It supports a variety of full-color embroidery designs and along the ability to place lettering in an arc (a rare feature in embroidery machines of its class). Here are the on-board features. Bring your embroidery creativity back to life by purchasing this awesome embroidery machine. The fact that it comes with 80 embroidery designs can’t be overlooked. Few embroidery machines are that generous with their arsenal of embroidery designs. This embroidery/ straight-stitch machine designed by Brother is packaged in a special Project Runway rolling case. Now you can take your machine with you on your travels. Why the Project Runway logo? It’s because with this machine you can create fashion wear whenever you sit down to sew. This machine will be an automatic favorite. It has fantastic features such as seventy images and designs inbuilt, lots of lettering fonts and over sixty decorative and straight stitches at your fingertips. With its intuitive computer connectivity, you can add designs from Disney, Nickelodeon and Warner Brothers to your embroidery repertoire. Make your children’s pajamas and even your slips and negligées. Buy this machine for its super capabilities and discover just what you can do with an embroidery frame and a reliable machine from this well-known brand. You can edit designs before you sew them. This means enhanced creativity and even more choice for the home craftswoman. Just imagine the embroidery projects that you can carry out with this machine. With one hundred and thirty plus inbuilt designs, six fonts for lettering and over one hundred and eighty types of stitch at your fingertips, you will be able to create some beautiful quilts and clothing. You will be able to “sew” wherever your creativity takes you. This machine even allows you to sew sideways, so it’s perfect for appliqué. Edit your design, mirror it and then preview it before sewing. Then get the machine threaded with its simple and easy threading system. Now you’re on your way to designing and embroidering projects that will look extremely professional. Buy this embroidery machine because it will make you feel like a professional seamstress. Your friends and family will be impressed with the work that you can turn out using this machine. A final feature is that it is iBroidery compatible. 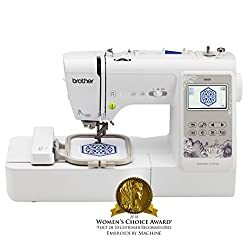 he Brother PE525 is a newer version of the PE520; it’s an embroidery machine only, which has some great upgraded features for the home craftswoman. Do you have the time for hand embroidery? If not this embroidery machine can do it for you. This incredible machine can be connected to a computer so that if the seventy or more designs that are incorporated into the machine’s functions are not enough, you can do even more. Vary designs by choosing from one hundred and twenty frames which will give a finished look to your project. The 4 X 4-inch sewing area can be rotated through angles from 10° to 90°. These incredible functions will keep you feeling busy and creative as you sew some delightfully complex designs. Buy this embroidery machine because it will allow you to embroider with skill and variety. It may even be possible to carry out some commercial projects with the help of this elegant embroidery machine. This embroidery/ straight-stitch machine designed by Brother is packaged in a unique Project Runway rolling case. Now you can take your machine with you on your travels. Why the Project Runway logo? It’s because with this device you can create fashion wear whenever you sit down to sew. 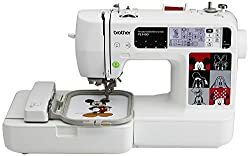 With its intuitive computer connectivity, you can add designs from Disney, Nickelodeon and Warner Brothers to your embroidery repertoire. Make your children’s pajamas and even your slips and negligées. Buy this embroidery machine for its value for money and the range of sewing and embroidery options that it offers. If you haven’t used an embroidery machine before, this machine could be a great machine to start out on. Are you looking for a dual purpose sewing and embroidery machine? The Singer Futura XL-550 can embroider as well as carry out more straightforward sewing tasks. To make things even easier for the home craftswoman, this machine has an inbuilt sensor that measures the pressure of the foot. This allows dress makers to sew through multi-layers and thicker fabrics easily. Two more excellent features which increase this machine’s versatility are the extra-large embroidery area (18.5’ X 11’) and a free-arm feature. Home dressmakers to do complete tasks such as sewing collars and hemming sleeves using this feature. In the machine’s embroidery mode, there are more than one hundred designs to choose from as well as many lettering fonts. Buy this machine for its ability to embroider and to do straight stitch sewing. This is a terrific machine for busy mothers who wish to be creative as well. Are you in search of the best embroidery machine on the market? You need to try out Brother PE540D. I am not a fan of the PE series of these machines but this particular model is stunning by all means. Check its incredible features below. The 4×4 in this embroidery machine defines the expansive embroidery working area. Brother PE540D 4X4 embroidery machine looks sexier than most members of the PE family. The colorful Mickey Mouse and friends designs of embroidery make it to be one of the most sought embroidery machines out there. Please imagine having the freedom of adding 35 Mickey Mouse and Friends embroidery designs on your embroidery projects! Your creations will have the diversity of a chameleon. The fact that you can import embroidery designs makes it even better. The embellishments are custom-made to meet the commonly preferred specifications of avid embroiders. 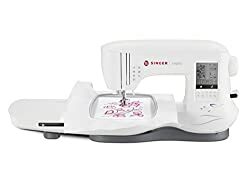 Another machine that does straight-stitch as well as embroidery, the Singer XL-400 has many helpful features. Not sure how to proceed? The Singer XL-400 has been manufactured with easy How-To tutorials built into the machine’s LCD screen. With a large and a small embroidery hoop and an inbuilt range of one hundred and twenty-five designs, this machine has some amazing software. These inbuilt programs can automatically transform imagery into a cross-stitch design, or transform photographs into embroidery designs. These fantastic features give this embroidery machine much additional potential. Buy this machine because it’s extremely user-friendly, yet it can do so much. Embroider a family photo onto the front of a tee-shirt…embroider a quirky slogan; it seems that the possibilities are almost endless with the Singer XL-400. One captivating thing about Singer SE300N is that the working area resembles a spacious trough-like surface with colorful rose “embroideries”. It is also designed around ergonomics considerations allowing a greater degree of ease of use. It is one of those beautiful embroidery machines you will stare at before starting to work on your embroidery projects, everyday. I looked at this machine for a long time nitpicking for flaws but I didn’t find any. It is almost perfect. I recommend this embroidery machine to anyone who would like to complete his projects faster with great diversity. We recommend that you examine different sections of our website. There’s a loom out there that sits tight so you can use it, and we’ve probably examined it now. If not, we will undoubtedly do it soon. Consider our site as a window into the universe of weaving. Whether you are an experienced amateur or a novice amateur, here you will find compelling, intriguing substance and we will do our best to deliver it further. The recommended machines listed above are but a few of the excellent models and brands available for purchase. As with all business endeavors and selection-making, you want to do as much research as you can. We’ve already cut your work in half by doing the research for you. We will also provide more information in the future to you to help you find your perfect match. 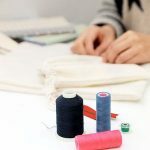 As difficult as starting your home embroidery business may seem, you’ve already taken the first and very big step, so give yourself a pat on the back. This comprehensive list is a steppingstone into this new and exciting world. 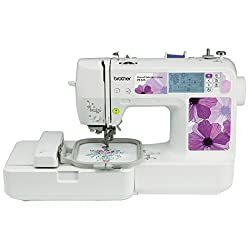 When you do finally make your choice, you will have your new embroidery machine, all of your sewing supplies, and, with some of these impressive machines, the ability to download new information and firmware directly to the machine. So, whether you are new to the world of embroidery or a sewing expert, these top machines will make your business run smoothly. They will increase your speed of production. You will get the desired results at a low cost. If you want to learn more, please check out more of our website’s articles for other information.